From Moms to Grandmas: Lets Celebrate Mom With Something Sweet This Holiday, Church's Chicken! Lets Celebrate Mom With Something Sweet This Holiday, Church's Chicken! Lets Celebrate Mom With Something Sweet This Holiday! Are you thinking about taking your mom out for a special Mother's Day Dinner? If you are up for some great chicken, you should think Church's Chicken. From May 8, 2015 through May 10, 2015 Church's Chicken is offering a special deal to those one in four families on Mother's Day Weekend- a Free 20 piece box of the Brand's signature Oreo biscuit bites with purchase of any family meal. 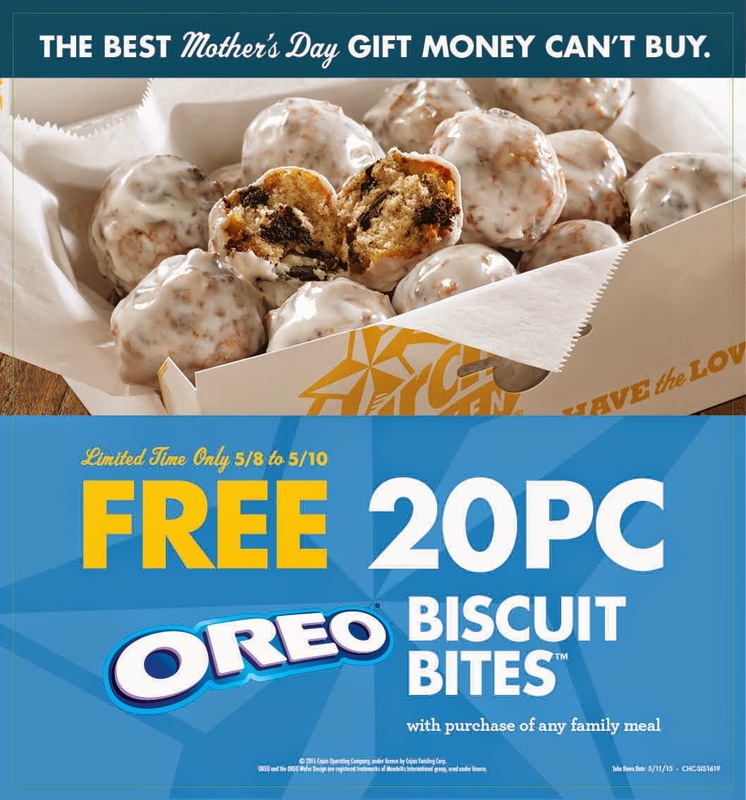 Guests who purchase any family meal will receive a free family-sized box of sweet treats, made from bite-sized scoops of Church's signature scratch-made biscuit dough combined with OREO crumbles and drizzled with sweet white icing. During The Introduction of the OREO Biscuit Bites, Church's served nearly two million Biscuit bites- making it one of the most successful limited -time offerings in the chains history. Church's Chicken was founded in 1952 by George W.Church in San Antonio TX. Church specializes in Original and Spicy Chicken freshly prepared throughout the day in small batches that are hand-battered and double-breaded, Tender Strips, Sandwiches honey-butter biscuits made from scratch and freshly baked, and classic, homestyle sides all for a great value. Want an afternoon snack or an after meal break? Oreo Biscuit Bites can be enjoyed for just .99. Grab them soon as their only offered for a limited time.